Wow, it's 10 years of HammerFall. Somehow it seems that they just around for a short time and at the same time it seems to be for ever... Anyway, the Swedish band is presenting a Best-Of album - double CD - after one decade. As always on Best-Of albums you get the bands classics and often some live versions and sometimes even some new tracks. Joacim Cans and his mates have re-recorded their hymn Hammerfall - actually I prefer the original version - and 3 new tracks. The opening track is The Abyss and is a nice intro which was written by Oskar Dronjak for his favorite hockey team. Last Man Standing is a mid-tempo rocker and will fit into their live set. But this best-of is only interesting for die-hard fans who buy everything of the band and people who discovered HammerFall just lately and don't have all the CDs. But that can be said about most best-of albums, I guess. Musically there isn't anything to complain and 2 CDs for the price of one is a fair deal. Btw, there is a video of the new HammerFall v2.0.07 in a rough mix can be found on the second disk, but somehow I can't view it on my computer.... To be honest I don't understand why they chose again The Metal Age as there are several live versions already. Anyway, if you like HammerFall then this isn't a waste of money. 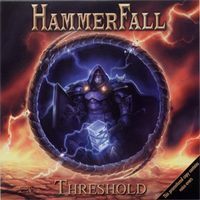 It's time again for a new Hammerfall album - the Swedish deliver good albums frequently for almost 10 years now - and Threshold is their 6th studio album. Opening with the title track Threshold the album starts with some choir and sounds of a spinett, but soon the band joins in to present their true metal. An uptempo tune with a catchy chorus and a hymn-like character which even this sounds like a typical Hammerfall song it holds some surprises. The following The Fire Burns starts with some guitar riffing and the shouted "Fire Burns" and the riffing is the main element of the song. Reminds me a bit of Accept - only the guitar riffing, not the song. Different is Rebel Inside, a partly balladesque heavy rocker. Here Joacim Cans' vocals are up-front and the main sound element which is later completed with some emotional guitar solo. But as usual Hammerfall present mainly faster songs with pounding drums, hammering bass and shredding guitar riffs. One of my favorites is Dark Wings, Dark Words which is a slow, intense one. Again Cans' vocals are dominate the track. The chorus has an epic touch which mainly bases on the backing vocals. The guitar lines are great and the solo fits perfectly. A nice rocker is Howlin With The Pack which I guess will make it into the set list next time.... Genocide begins a bit classical influenced, but soon speeds up - an up-tempo hymn. The long intro to Carved In Stone is a bit too long and gets a bit boring, but when they finally kick off the songs it become a heavy rocker, but not one of the highlights. This one I wouldn't have missed, if it wouldn't end up here... But still a great album. To check this album out, you should listen to Threshold, Dark Wings Dark Words and Rebel Inside. In general it can be said that this album offers a variety from balladesque to up-tempo tunes. 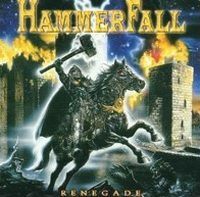 First I want to say that if you never liked HammerFall, then this album won't change it. The Swedish continue what they did with Legacy Of Kings. When I compare Renegade with their other releases Glory To The Brave and Legacy Of Kings then I would place it between them. Renegade is not as good as Glory To The Brave, but is better then Legacy Of Kings. Partly it's because this time the band did the songwriting on their own and decided not to do any cover versions. 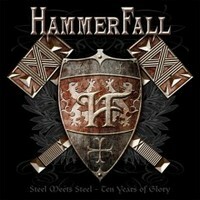 Production-wise this album is the best HammerFall have done so far. It's obvious that a real master of the board was responsible for the production - none other then legendary Michael Wagener. Beside that they take their time to do Renegade and you can hear this at the album. Especially the vocals are better. Musically and lyrically they mainly stick to their roots - something I really appreciate. Templars Of Steel is the opener - with a kind of intro as part of the song. Straight ahead they go with Keep The Flame Burning, Renegade and Living In Victory. With Always Will Be they slow down and present the only ballad on Renegade. With The Way Of The Warrior they speed up and get heavy again. Same can be said about Destined For Glory. After The Champion follows the instrumental Raise The Hammer. And A Legend Reborn is kind finishing this one off. I hope that next time HammerFall will get a bit heavier, coz with this production and the talent they have they should be able to top Glory To The Brave! 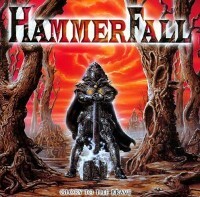 This is the 3rd album of the Swedish true metal band Hammerfall. A big production is delivering a great sound, but musically I think that this one is a little weak... Well, not exactly weak, but to close to the predecessors. Beside that the songs don't have the magic of the ones of the debut. The debut put the listener under a spell, this one will get boring after several spins... At least for me. Beside the ballad Always Will Be the powerful tracks Templars Of Steel and The Way Of The Warrior are my personal highlights of Renegade.